Nova Scotia and Newfoundland can expect heavy surf over the next few days ahead of Hurricane Leslie, a Category 1 storm which is currently churning slowly toward Bermuda. Residents of the British territory were stocking up on emergency supplies today and tourists were cancelling holiday plans to the remote island. 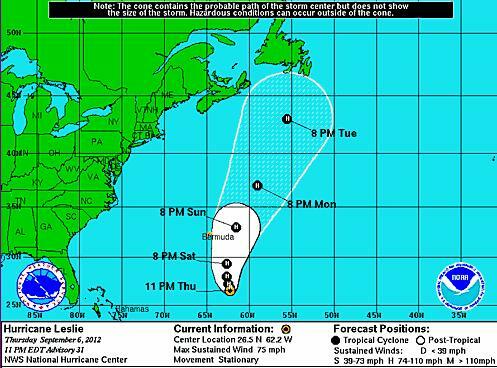 The Canadian Hurricane Centre says Leslie could impact Atlantic Canada by Tuesday but its path is still uncertain. Some models show Leslie making landfall in Cape Breton while others show it veering off to the northeast and being pushed back to the ocean by a high pressure system.